Know what you want to bring to your new home and what you don’t. Taking inventory and knowing what you want to bring to your new home is an important part of every move. Before you get started, here's a quick tip to help you sort through everything and remove some clutter or extra items you no longer want. After all, the fewer items you move, the more you will save on your moving budget. On pickup day your moving company will take inventory of your household items while they are packed and loaded onto the truck. During this process they should also take note of any prior damage to your items so that any dispute can be handled fairly. Be sure that everything is recorded accurately, and once complete you should review their inventory to make sure that nothing was missed. Do some prep work on your own before the moving day arrives. It is a good idea to take pictures to keep a record of the exact condition of your items, particularly wood furniture and painted items. Keeping a complete record of condition will help you sort through an insurance claim if for any reason something is damaged in route. When your long distance moving company has finished loading and compiling an inventory, they should provide you with a copy for your records. This is a good time to sit down for a few minutes to review the list before you signoff on the move. 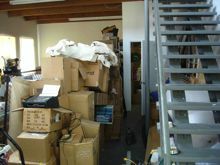 Make sure you are satisfied that all the information is correct before the moving crew leaves. compiled a good record beforehand, everything should go smoothly.